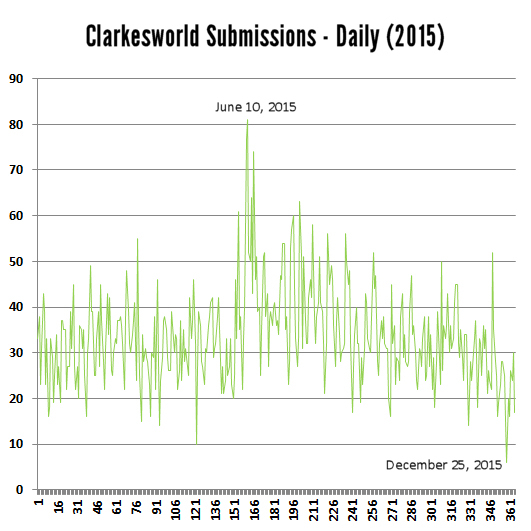 Every now and then, I dive into the data from the Clarkesworld Magazine submissions system. This time, I’m looking at our 2015 data. In looking over this data, please keep in mind that these charts represent QUANTITATIVE data which would incorrectly imply that all stories are equal. The process of selecting stories for publication is a QUALITATIVE process reflective of our opinions. If we were to receive more zombie stories than any other kind of story, it wouldn’t necessarily mean that we would be more likely to publish zombie stories. I don’t like zombie stories, so we don’t publish them. Quantity can be misleading in a qualitative process. The spike in June corresponds with the increase in our upper word count limit to 16,000. A number of writing-for-pay websites capitalized on the announcement and sent hundreds of people our way. 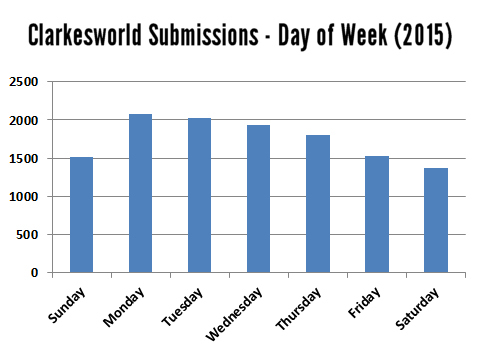 We get fewer submissions on the weekend. This chart shows the submissions by month in blue and the “near miss” letters by month in red. 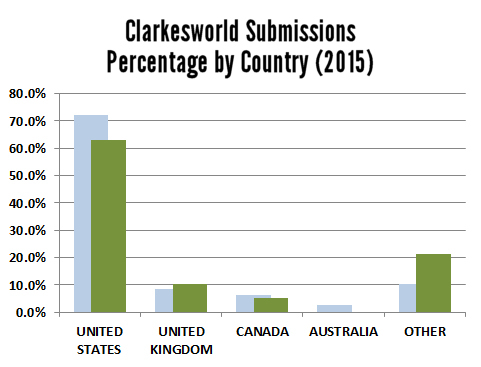 In 2015, 2.53% of all submissions received our top-tier rejection letter. 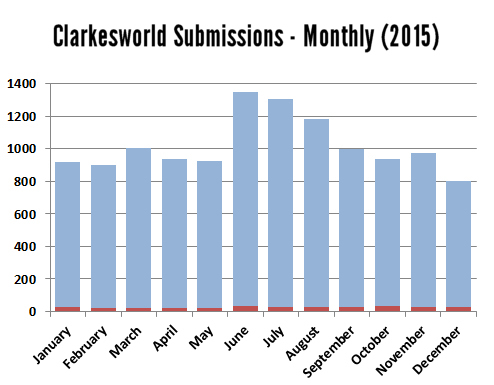 The monthly average for submissions was just over 1000 and the first two months of 2016 have trended higher. The red line represents top-tier rejections and the green line represent acceptances. The acceptance rate for 2015 was 0.3%. In this chart, blue bars represent the percentage of submissions and green indicates the percentage of accepted stories. 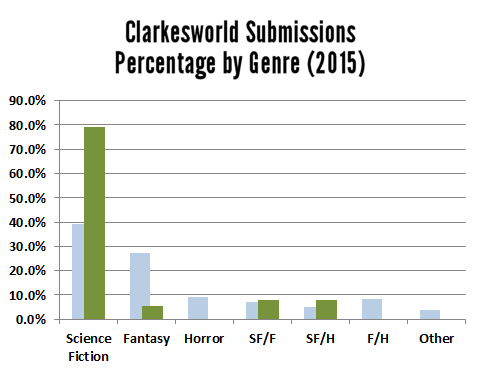 2015 was a very strong year for science fiction submissions. I was hesitant to post this graph for fear of discouraging writers in other genres. We want those submissions too. Very fascinating post. I love me some hard data. I’ll be submitting sometime next week (I’m from Brazil) It’s nice to know that the acceptance rate is only 0,03%. This way I won’t feel terrible if I’m rejected, and I’ll feel *awesome* if I’m accepted.